Canfers Barn sleeps 2, Bayses Barn sleeps 4, but is also perfect for 2. Both barns are spacious and have been decorated and equipped to a very high standard. All bedrooms are en-suite. Both barns have private gardens and sunny terraces. Canfers is on the edge of the village. Bayses sits in a secluded and tranquil postion overlooking the farm. Dogs are welcome. Access to beautiful walks on the farm. 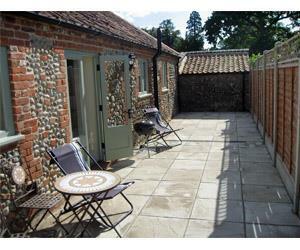 Both barns are perfectly located for exploring the North Norfolk coast, Holt is 4 miles away, Blakeney is 7 miles away. Surrounded by great pubs. Children Welcome - Bayses Barn Internet Access - Bayses Barn Non smoking Children welcome from any age.